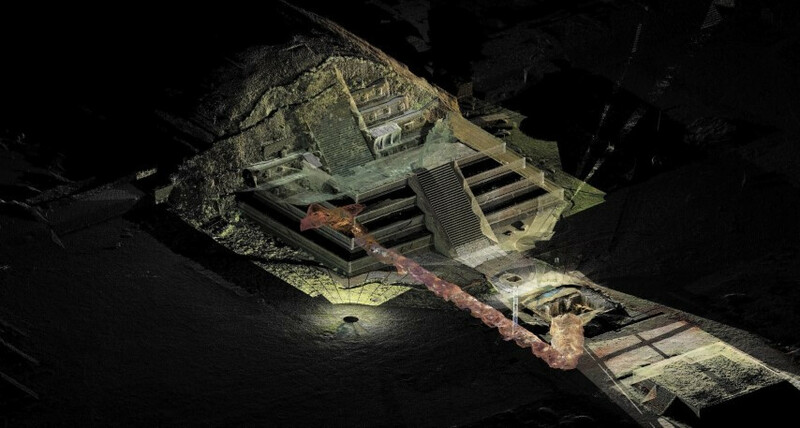 When last we saw the tunnel underneath the Temple of the Feathered Serpent in Teotihuacan, the remote vehicle Tláloc II-TC had forged 65 feet ahead of the point where humans could tread and identified the presence of three chambers with its infrared camera and laser scanner. Wednesday Mexico’s National Institute of Anthropology and History (INAH) announced that archaeologists have reached a space just before the three chambers and have discovered there a massive cache of sacred objects. The tunnel was discovered by chance in 2003 after heavy rains opened a hole more than two and a half feet (83 cm) wide in front of the Adosada platform, a 4th century structure inside the Citadel that faces the temple. Fifty feet under the hole, archaeologists found a tunnel almost 400 feet (120 meters) long. Excavations began in 2009, with initial explorations done with ground penetrating radar, laser scanning and two robots. The technology was only the beginning. The tunnel was expertly sealed by the residents of Tenochtitlan in the second century A.D., filled top to bottom with soil and rocks. The heavy lifting was done by at least 25 workers at any given time, one of whom was Julio Alva, a descendant of 17th century Nahuatl chronicler Fernando de Alva Ixtlilxochitl, himself a direct descendant of Ixtlilxochitl I and Ixtlilxochitl II, rulers of Texococo, and of Cuitláhuac, the penultimate ruler of Tenochtitlan. Alva and his comrades worked tirelessly to remove 970 tons of earth and stone to make way for the remote vehicles and archaeologists to explore the tunnel. INAH archaeologists have now reached the 103 point where they have encountered a space 13 feet wide and 26 feet long filled with an extraordinary wealth of objects: 50,000 artifacts, including organic remains perfectly preserved in the low oxygen environment. There are more than 4,000 wooden objects, bones and fur from large cats, beetle skeletons, more than 15,000 seeds from different plants and the remains of skin, possibly human, which will be submitted for laboratory analysis. On the non-organic side are beautifully carved stone sculptures, four of them anthropomorphic figures two feet tall made from greenstone, scores of shells from the Gulf of Mexico and Caribbean Sea, imported Guatemalan jade, rubber balls, pottery, pyrite disks and a wooden box filled with dozens of elaborately engraved conchs. There are beads, complete necklaces, amber and dozens of obsidian blades and arrow heads. All of these offerings were interred in the tunnel between 150 and 200 A.D., a period known as the Miccaotli phase when Teotihuacan’s plan was being vigorously altered with previous buildings taken down and new ones erected that would redesign the city. With no written records to go by, archaeological remains are invaluable to the study of Teotihuacan’s culture and history. This space is 18 feet deep, and given its location close to the end of the tunnel in front of the three chambers, archaeologists think the explosion of artifacts is a strong indicator that there are significant burials in those chambers. [Archaeologist Sergio] Gomez, who works for Mexico’s National Anthropology and History Institute, said he hoped to find a royal tomb at the end of the tunnel. “Due to the magnitude of the offerings that we’ve found, it can’t be in any other place,” he said. Here’s a video that takes you down the tunnel and shows some of the highlights of the recent discoveries. There’s no narration but there is some music well worth muting.